1. Are You Ready to Launch? 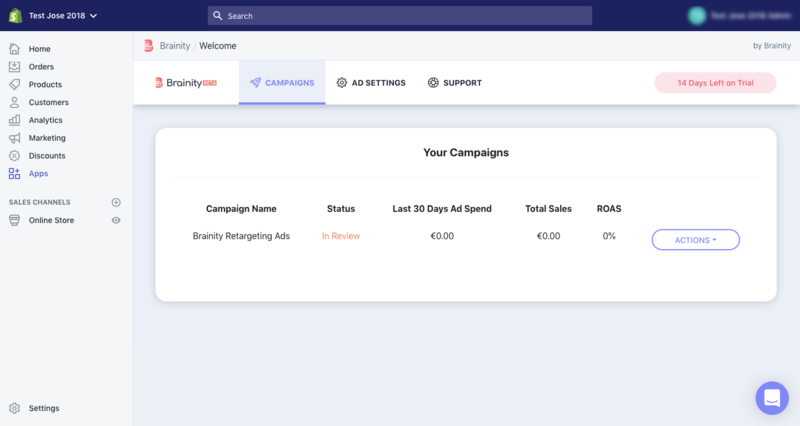 Once you have installed Brainity and created your account, Brainity will analyze your store traffic to indicate if you have have enough qualified traffic to do a retargeting campaign. 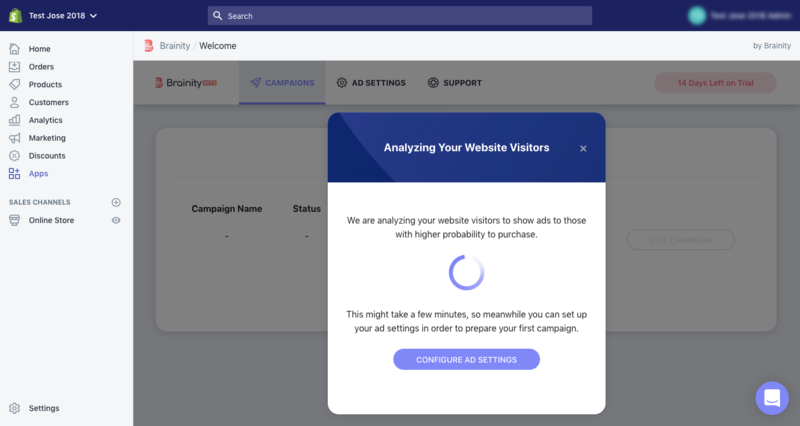 After 1 or 2 minutes, Brainity will let you create your first campaign if you have enough qualified traffic to do a good retargeting campaign. If you don't have enough qualified traffic, we recommend you focus on improving the quality and quantity of your traffic through marketing campaigns before creating your first retargeting campaign with Brainity. 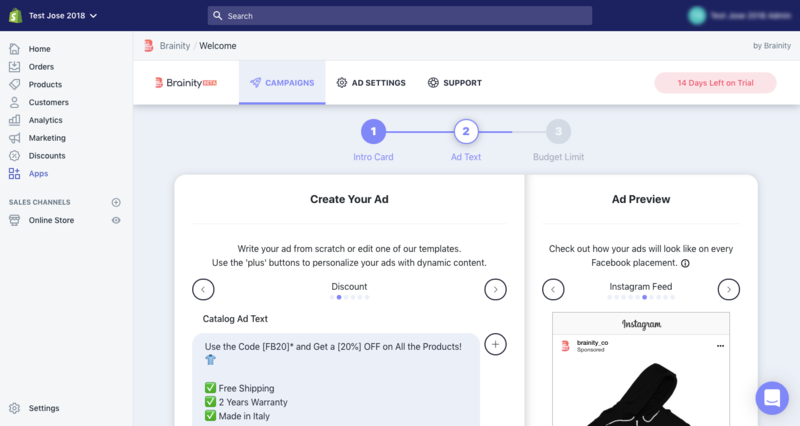 Brainity offers you five templates to help you write a killer ad. Edit them or write a new one from scratch. We suggest using dynamic content in your ad text and titles so your audience will receive a more personalized ad experience based on the products that had seen in your store. To use it just click on the 'plus button' at the right of the text boxes. You just need to choose your monthly ad spend limit, and we'll take care of the execution and optimization, spending only what it’s strictly necessary in order to increase your sales and profit. 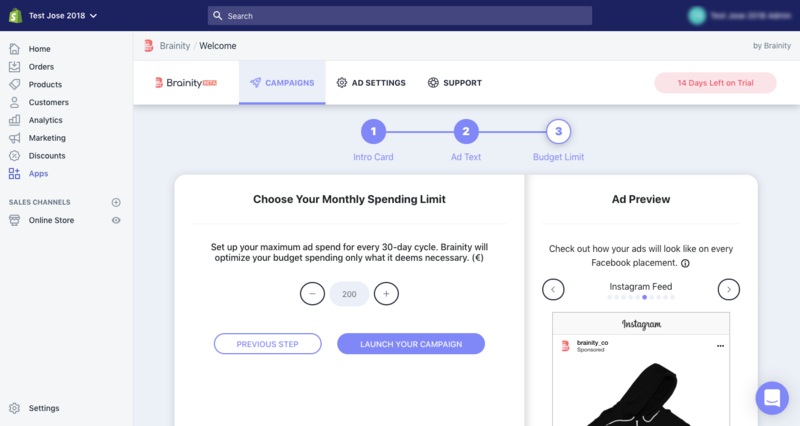 Brainity will optimize your budget spending only what it deems necessary. Congrats! Your campaign is ready to go. You only have to wait for Facebook to approve the campaign (this could take a few hours). When this happens you will see that the status of the campaign will appear as 'Active'.